|01| Neuroglia represents a concerted effort of European research groups dedicated to increase our knowledge on glial function and to unravel the role of neuron-glia interaction in the healthy and diseased brain. In particular, the consortium investigates glial cells in initiation and progression of epilepsy. |02| The EU-supported European Cooperation in Science and Technology COST action NANONET - Nanomechanics of intermediate filament networks will establish the first scientific platform to focus and integrate the exciting new knowledge on intermediate filaments with novel developments in cell biology, molecular biology, medicine, (bio)chemistry, engineering, mathematics and physics. |03| The International Astrocyte School is aimed at all those who are attracted by the intriguing hypotheses on the role of astrocytes in brain function and wish to learn how to approach these problems. The school is especially targeted at young scientists beginning their careers, but is also open to senior scientists wishing to refresh their glial background. |04| In 2006, the Trustees of the University of Alabama at Birmingham (UAB) established the Center for Glial Biology in Medicine (CGBM) dedicated to studying the role of glia in health and disease. The creation of this Center confirms UAB as a leader in the field of Neuroscience – crossing the boundaries of clinical Neurology/Surgery/Rehabilitation Medicine and Basic Sciences. The overall mission of the UAB Center for Glial Biology in Medicine is to provide a comprehensive University-wide program to support basic and clinical research on the biology of glial cells. |05| The Achucarro Basque Center for Neuroscience is a research institute fostered by the Basque Science Foundation (Ikerbasque) and the University of the Basque Country (UPV/EHU). It is devoted to fundamental and translational research in neuron-glial biology, and to the discovery of new therapies for brain diseases. |06| The Spanish Glial Network (Red Glial Española, RGE) was founded in 1997 by Manuel-Nieto Sampedro and Bernardo Castellano with the goal of promoting collaborative research and boost the formation and mobility of young investigators. Currently, it consists of over 40 research groups, and is headed by Alfonso Araque (Instituto Cajal, Madrid). 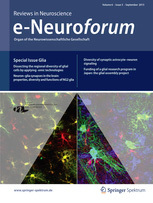 The French Glial Cell Club is one of the scientific club under the aegis of the French Neuroscience Society and is part of the Euroglial Netwok. The Club aims to promote research on every aspects of glial cell physiology and pathology, to actively encourages the career of the young researchers, to organize working groups and to gather and support scientific events in France related to glial cells. The Club organizes one-day annual meetings as well as biennial symposium (2 1/2 days), and held the European Conference Euroglia in 2009 in Paris. Glial Assembly: A new regulatory machinery of brain function", funded by by Japan Society for the Promotion of Science, is a consortium focussing on functions of "glial assembly", a gigantic glial circuits in the CNS. The purpose of this project is to clarify the mechanism that underlies the formation of glial assembly and to understand how they control the brain function. We also aim to clarify how abnormalities in glial assembly are related to the pathophysiology of neuropsychiatric disorders. The Portuguese Glial Network gathers Portuguese researchers, as well as foreign researchers working in Portugal, who are interested in the role of glial cells in the function of the nervous system, in health and disease conditions. The main goals are: (a) To gather and share information about Portuguese researchers (or foreign working in Portugal) that study glial cells, their approaches: techniques and models used; (b) To potentiate the collaboration among research groups to make the most of human, technical and scientific resources, in order to promote the generation of knowledge with greater impact and attraction of competitive funding; (c) To foster mobility and diversify the training of researchers; (d) To disseminate research focused on glial cells both in scientific channels and for the society. GliaNed is a networking group for all interested in Glia research in the Netherlands.